The 1999 Xerox WorkCentre XD125f is the fast sister of the XD100, a desktop multifunction laser printer and copier for making single-sided B&W images in resolutions up to 600 x 600 dpi at speeds up to 12 ppm, with a 30-page document feeder. The XD125f uses a stationary 8.5” x 14” platen for scanning instead of a sliding platform to keep its footprint no bigger than its physical size. Smaller than the Xerox’s XC line, the 49-pound XD125f’s recessed output tray reduces the overall footprint of the multi-function down to only 20.5” x 19”. The control panel on the XD125f has been redesigned but still straightforward, with indicators and keys for intuitive control and conditions of the copier. To isolate an error, locate an empty tray, or paper jam, the panel includes a diagram of the copier with LED indicators to indicate the area that requires attention. The XD125f has a paper tray capable of holding up to 250 sheets paper. Paper sizes range from 5.5” x 8.5”, to legal size with bond weights varying from 15# to 24# in the main tray. The side of the copier has a multi-purpose slot for single transparencies, labels, post cards, and envelopes. Copiers of this type tend to be very sensitive and jam with paper that has been previously opened and sitting in a humid environment. You also might want to avoid the thinner, cheaper copier papers. Xerox lists the copy speed as part of the model number for its WorkCentre XD products. Therefore, a “WorkCentre XD102” has a 10ppm copy speed, and an “XD125f” has a 12ppm copy speed. The “f” at the end means it has an automatic document “feeder”. Get it? Up to 100 one-sided copies can be made of a single-sided original, with copying speeds at 12 pages per minute. The XD102f has a document feeder that allows up to 30-sheets to be collated for one copy. A step up from the XC series, copies can be adjusted from 50% to 200% of the original, in 1% increments or in 6 jumps. Copy quality can be set either manually, automatic adjustment of contrast, text or photo priority. The Toner Save feature is best used for draft copies and not for anything you want to distribute. There’s nothing more frustrating than when you rush to a copier to make a single copy only to realize you’re getting 25 enlarged copies because the previous user forgot to reset the settings (also known as “Leaving the toilet seat up”). Fortunately, Xerox realized this and the XD125f will reset all setting to it programmed defaults after 1 minute of inactivity. As a printer, the XD125f connects to your Wintel machine through a parallel cable. Having a maximum resolution of 600 x 600 dpi, the XD125f prints decent monochrome text and graphics. The resolution isn’t the best for detailed B&W photos. Compared to new multi-functions, this 1999 model uses considerably less power. In standby the XD125f only consumes only 20 watts of power, compared to today’s copiers and printers. The Automatic Document Feeder (ADF) for these copiers has a tendency to jam on all but pristine, flat originals. Since most originals will have to have the staples removed, extra care has to be made to insure the stapled pages are separated and flat for the ADF to successfully take them. Sometimes it’s faster to just put the originals on the platen one at a time than use the ADF. Compared to today’s copiers and printers, the XD125f shows its age with a slow 12 pages per minute copy speed and 8 ppm in printer mode. As a printer, its print speed is slower than today’s color lasers, offering faster speeds at higher resolutions.To use the printer portion of the WorkCentre XD requires having a computer with a parallel port. Since parallel ports are becoming rare as more motherboard manufacturers have switched to replacing this port with a couple of USB ports, most AMD/Intel computers won’t be able to connect to an XD model without using a USB-to-Parallel adapter, an additional $25 expense with software that can allow Macs to use the XD as well. 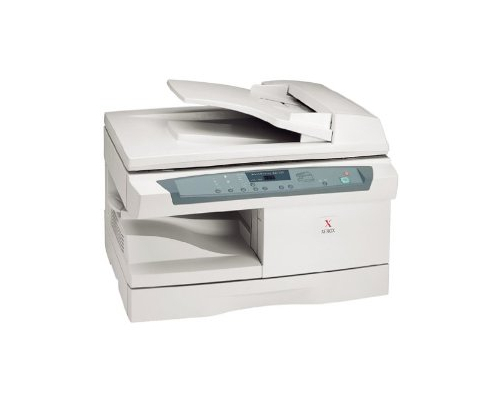 Review it: "Xerox WorkCentre XD125F "
The toner and drum are separate items to cut down on replacement costs. 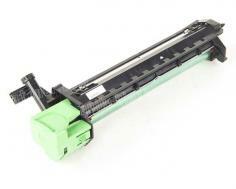 The side and front panels must be opened to gain access to the toner and drum cartridges. 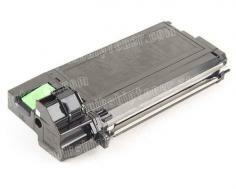 The toner has a 6,000-page yield with 5% ink coverage. The drum will need replacing after every third toner or every 18,000 copies. During the course of changing toner people often forget to keep track when it’s time to change the drum. Combo-packages are available that offer the drum with several toners. By the time the toners are consumed, the remaining drum is replaced. These combo-packages make maintenance easier and increases overall longevity and print quality.